These four panels are from one 1883 cremation program showing the order of the ceremony’s events. Foreign language books were frequently elected for cremation. The books chosen this year were Arnold’s Greek Prose Composition and the German instruction book, Ahn’s Method, Fischer’s Edition. As shown in the bottom left panel, the students gave tribute to the books in the IV. Laudatio Arnoldi and the VIII. Laudatio Ahni. 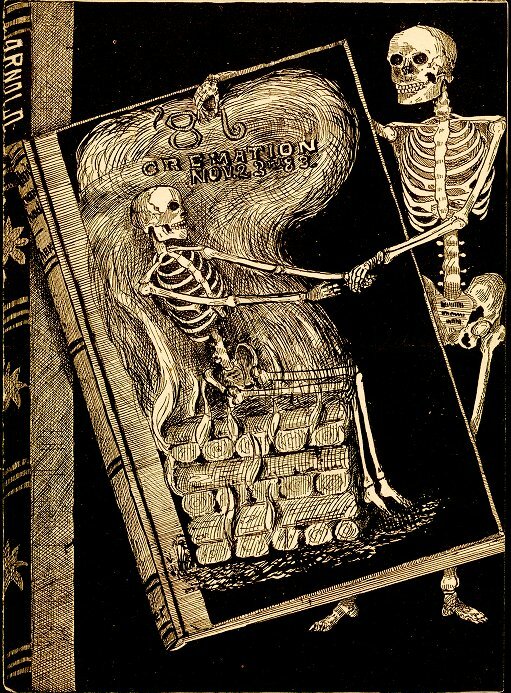 The German poem reflects the common tradition of writing part of the program in the language of the burned books.